Mix all marinade ingredients and pour over the meat (you can put it all in a large zip-lock). Marinate at least two hours or overnight. Grill meat until cooked through. Heat the 1/4 cup of olive oil (not extra virgin) in a saute pan on the stove and begin sauteeing the onions over medium heat. 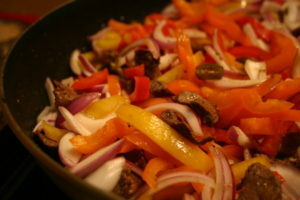 Add the peppers and continue to cook until peppers are soft and onions are beginning to brown and crisp. Serve on Mission Carb Balance Flour Tortillas, add meat then peppers & onions & any of the optional toppings. *Note from Mennen: At first I thought this was just an ad for McCormick, but after trying this I did not care. We make fajitas once/week, alternating between chicken and meat. Also, caution when cutting up the habeneros–wear rubber gloves. And, credit to Heidi Sue for this recipe.